All four pathways were developed in collaboration with Public Health England. NICE public health guideline PH24: Alcohol-use disorders: prevention, recommends that health and social care, criminal justice and community and voluntary sector professionals should routinely carry out alcohol risk identification and deliver brief advice as an integral part of practice. Users learn how to use World Health Organisation validated tools to identify patients’ levels of health risk from alcohol and how to intervene appropriately with those who could benefit from cutting down their alcohol consumption. The curriculum is based on the robust evidence-base of more than 60 controlled trials over 30 years which show that simple structured feedback and motivational advice lasting a few minutes is effective in reducing health risks from alcohol including hypertension, CHD, mouth, throat and breast cancers and many other conditions. Recipients reduce their alcohol intake by an average of 15% which will return a net saving to the health and social care system. Widespread use of IBA is therefore recognised as a contributor to Making Every Contact Count (MECC) and is a feature in the NHS Health Check, CQUIN programmes and efficiency savings programmes. Reduction from 50 units/week to 42 units/week reduces the relative risk of alcohol-related conditions by some 14% and the absolute risk of lifetime alcohol-related death by some 20%. The overall goal of the Alcohol IBA e-learning programme is to enable the learner to effectively engage with non-dependent alcohol misusing patients, who may not realise they may be taking risks with their health. Community Pharmacies are part of the primary care umbrella. Therefore, it is important that they have the most up-to-date information to be able to discuss with patients the impact lifestyle choices have on their health. IBA is the delivery of ‘simple brief advice’ which follows identification of how much your patient is drinking and problems they may be experiencing. IBA is usually delivered by non-alcohol specialists and has been shown to be effective in helping people to reduce their alcohol health risk. This module of 4 sessions is aimed at staff working in community pharmacies. It will help you undertake screening and then give routine, opportunistic ‘simple brief advice’. Dental teams are part of the primary care umbrella. Therefore it is important that they have the most up-to-date information to be able to discuss with patients the impact lifestyle choices have on oral health. 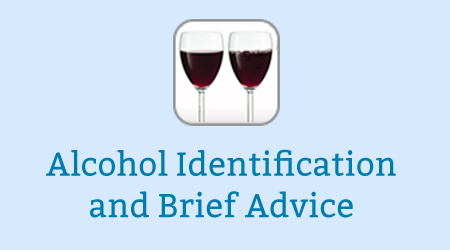 IBA is the delivery of ‘simple brief advice’ which follows identification of how much your patient is drinking. IBA is usually delivered by non-alcohol specialists and has shown to be effective in helping people to reduce their alcohol health risk. This module of 4 sessions is aimed at dental teams and will help you undertake a screening test and then give routine, opportunistic ‘simple brief advice’. This programme is aligned to Section 8 ‘Alcohol Misuse and Oral Health’ within Delivering Better Oral Health. Hospital settings offer opportunities to “Make Every Contact Count” therefore it is important that staff have the most up-to-date information to be able to discuss with patients the impact lifestyle choices have on their health. IBA is the delivery of ‘simple brief advice’ which follows identification of how much your patient is drinking and problems they may be experiencing. IBA is usually delivered by non-alcohol specialists and has shown to be effective in helping people to reduce their alcohol health risk. This module of 4 sessions is aimed at staff working in hospital settings. It will help you undertake screening and then give routine, opportunistic ‘simple brief advice’. Primary care provides an important opportunity to intervene in risky alcohol use and encourage change. It is important that practice team members have the most up-to-date information to be able to discuss with patients the impact that lifestyle choices have on their health. IBA is the delivery of ‘simple brief advice’ which follows identification of how much your patient is drinking and any problems they may be experiencing. IBA is usually delivered by non-alcohol specialists and has shown to be effective in helping people to reduce their alcohol health risk. This module of 4 sessions is aimed at staff working in primary care. It will help you undertake screening and then give routine, opportunistic ‘simple brief advice’. Public Health England commissioned Public Health Wales to pilot this programme across three areas in England – Yorkshire and Humber, the North East and the South West. Each area established an area-wide collaborative to plan and oversee the pilot. Workshops to ‘train the trainer’ were held in each area, making use of the supporting materials from ‘Have a Word’. The pilots helped to refine the training and support materials from ‘Have a Word’ and develop a final set of materials to make available across England to support training and the implementation of IBA in the NHS and other settings. Training materials and other IBA support materials are available here to download and print. Note these documents do not form part of the e-learning programme. If you already have an account with e-LfH, then you can enrol on to the Alcohol IBA programme by logging in to the e-LfH Hub, selecting My Account > Enrolment and selecting the programme. You can then access the programme immediately in the My e-Learning section. The Alcohol IBA programme is also available to NHS healthcare staff via the Electronic Staff Record (ESR). Accessing this e-Learning via ESR means that your completions will transfer with you throughout your NHS career.